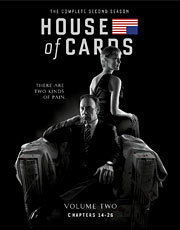 WHAT: After being sworn in as the new Vice President, Frank Underwood (Kevin Spacey) continues his quest for absolute power alongside his equally manipulative wife, Claire (Robin Wright). Meanwhile, a team of D.C. journalists investigate Frank’s involvement in Peter Russo’s death, witnessing first-hand the level of corruption at work in their government. WHY: Season Two of “House of Cards” will likely be labeled a disappointment by some, but while it’s noticeably weaker than the Netflix drama’s debut season, it’s still better than a vast majority of the shows on television. After all, there aren’t many series that would kill off one of its main characters in the first episode, especially in such ruthless and shocking fashion, but it’s a necessary move that signals a change in the direction of the show. The ancillary subplots aren’t nearly as interesting this time around (particularly the stuff between Michael Kelly’s Chief of Staff and Rachel Brosnahan’s reformed call girl), and even the main story feels a bit stretched at times with the constant back and forth between Underwood and Raymond Tusk, but there’s rarely a dull moment thanks to the excellent writing and performances. Kevin Spacey and Robin Wright are in top form once again as the conniving husband-and-wife duo, while Molly Parker (of “Deadwood” fame) is a welcome addition to the cast as the new House Whip. And when you have characters as brilliantly realized as the ones that populate “House of Cards,” you’re allowed a few missteps every once in a while. EXTRAS: The four-disc set boasts a quartet of production featurettes (including an examination of the differences between the British and American versions of the show) and a behind-the-scenes look at a table read for two episodes from Season One. 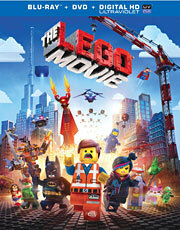 WHAT: When an ordinary LEGO construction worker named Emmet (Chris Pratt) stumbles upon an ancient artifact, he’s declared “The Special” by an underground group of rebels led by the blind prophet Vitruvis (Morgan Freeman), who believes that Emmet is the only one capable of stopping the evil President Business (Will Ferrell) from destroying their world. WHY: When “The LEGO Movie” was first announced, there were obvious concerns about whether it would just play like one long commercial for the popular toy brand. But while the folks at LEGO have undoubtedly seen a nice bump in business since its release, the film is so much more than that – smart, funny and surprisingly heartfelt. A lot of that credit goes to directors Phil Lord and Christopher Miller, who bring the LEGO universe to life with the sort of boundless imagination that the movie preaches to its audience. Though the script borrows heavily from “The Matrix” (from its main story, to the three leads, to its anti-conformatist message), that’s merely the setup for a much more sophisticated payoff that is equally daring and brilliant. For as great as the film’s ending may be, however, it wouldn’t feel earned if the first two-thirds weren’t so enjoyable. And thanks to some incredible visuals, great voice work (particularly by Chris Pratt) and hilarious gags, “The LEGO Movie” isn’t just one of the best animated films in years, but it’s also one of the best movies of 2014 thus far. EXTRAS: The Blu-ray release includes an audio commentary with directors Phil Lord and Christopher Miller (along with actors Chris Pratt, Will Arnett, Alison Brie and Charlie Day) and a host of bonus material like a making-of featurette, deleted scenes, outtakes and a series of fun mini-featurettes.